There are a few classic pieces in my wardrobe that, over time, have withstood the many trips to consignment stores, salvation army, etc. You would never know that a particular dress, pair of slacks, or jacket is say...8 years old. I know high-waisted pants and skirts are of the moment but seriously, a high-waisted pencil skirt is more classic than trendy. 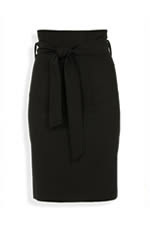 This is the perfect classic black pencil skirt. Click here for details on this little number.